Are you are a person who likes to smile? Or do you want to know what percentage of your smile? The technology will make it easier. To find out what percentage of your smile is enough to use a gadget, and a few moments later you will be given a value for the perfection of your smile. The Register reported, Japan could already make a piece of software that can detect the strength of one’s smile. Smile detection Software name is Smile scans. Actually smile detection technology currently used by some compact cameras (surely that is digital). But beyond that this technology has been designed to detect how the perfect a smile. Smile Scan will assess the quality of your smile. This software made by Omron measures the movement of key points on your face, like the edges of your mouth, nose, and eyes to detect sections and the level of your smile. It will then display the score on the power of the smile is real, with the highest value is 100%. 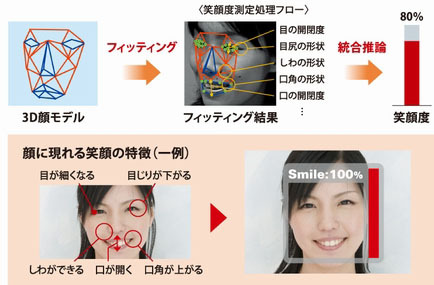 Japan company behind the Smile Scan: Omron, said that “This software will be used to train someone to smile, especially in a job that demands a smirk face always good and interesting is the important thing, among others is the receptionist, models, dentists, etc.” her advice. But until the news is published there is no more information about this software and how to choose a camera as a media, as well as how it works still has yet to be proclaimed. So smile. Related to "Smile Detection Software"